With Sloan, Dev can envision a new life—a real home. Unless a vengeful man fresh out of prison succeeds in finishing what he started. I wasn’t sure what to expect when I started reading this book, but OUT RIDER was sweet, tender and packed an unexpected emotional punch. I especially loved how perceptive Sloan was when it came to Dev and how gentle he was with her. A burst tire is what brings Dev McGuire and Sloan Rankin’s lives in alignment but it is their immediate connection and shared interests that will keep them together and heal them. Dev moved almost half way across the country to avoid a former co-worker who stalked and assaulted her and Sloan still bears the bruises from his failed marriage, so it’s understandable that both of them are wary about exploring this connection between them. Dev has been dealt a bad hand for most of her life and let down at almost every turn by the men in her life, from her father to her superiors at work, so she really has no high expectations that Sloan will be different. She just wants to be left in peace so she can heal and begin to feel comfortable in her skin again, but it will take a hard heart to resist her appeal and the urge to protect her and Sloan is definitely a soft touch. When her stalker follows her across the country, will she be able to count on Sloan? Or will she be left to twist in the wind again? OUT RIDER is a slow building romance that focuses mostly on the growing feelings between Sloan and Dev and how he took his role as her protector very seriously. I also love how he surrounded her with people that cared and gave her a place to belong and the family she had always wanted. I’m not much of an animal lover but I really enjoyed how Ms. McKenna made their working dogs an integral part of their story and brought the beauty of the Grand Tetons to life for readers. 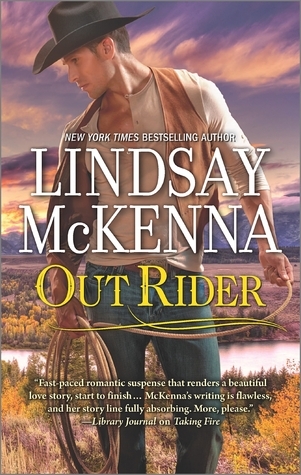 I haven’t read many of the previous books in this series but this one stands alone and there is no difficulty following along and I’ll definitely recommend this to anyone who loves a good western romance.